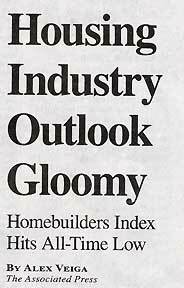 October 16, 2008, The Albuquerque Journal, Front Page Headline after Dow plunged 733 points “on stream of disheartening economic data” released on October 16, 2008. October 16, 2008, The Albuquerque Journal, Front Page of Business Outlook after government report confirmed September 2008 retail sales were down 1.2% - almost double expectations. October 17, 2008, CNN.com America's Money Crisis. October 17, 2008, Associated Press. October 17, 2008 Rhinebeck, New York - The American government bought $250 billion in ownership of United States banks this week of October 13th. The week before, it authorized nearly a trillion dollars to bail out Wall Street that included even saving the world’s largest insurance company, A. I. G.